If you are familiar with FTP you probably do not need this tutorial. You can use any FTP client you want. This is an introductory tutorial for people who are new to using FTP software. Filezilla is a popular free FTP program that makes it easy for you to download files from Renderon. FileZilla supports Mac, Windows and Linux. After installation, you will see a shortcut on desktop, double click on it to open the software. Add a custom name for this site like 'Renderon FTP'. Set the Logon Type to "Normal" and then insert your FTP username and password that was provided by Renderon. Press the "Connect" button & accept any 'certificate warnings' that appear. Now that the site and password are saved you only need to double click the name in 'Site Manager' to connect in the future. On the right-hand side, you have the files from Renderon's FTP server. 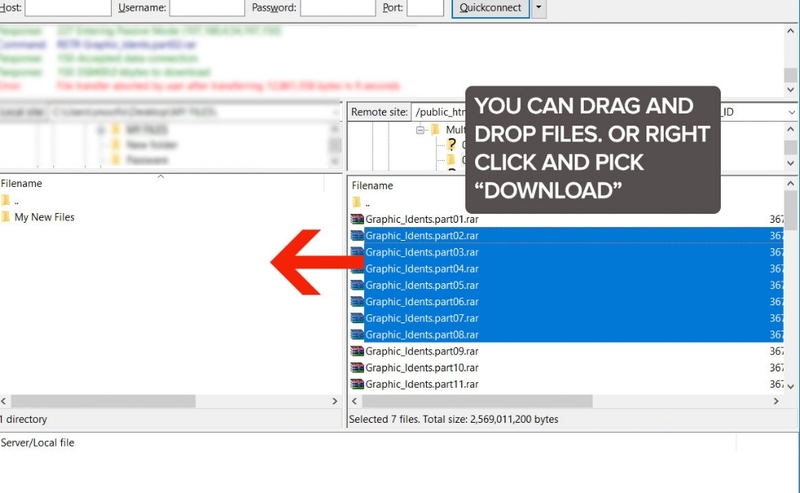 To download a file from the Renderon server, right click on the file and choose Download. Or simply drag and drop from the right to the left (this is probably the easiest). You can download multiple files at once. Or even download a WHOLE folder with one click! Make sure to remember where you saved them on your computer. Once installed on your computer click on any of the .RAR files that you downloaded from Renderon on your computer. Winrar will open and you will see the file or files contained within your selected .RAR archive. Simply click the 'Extract To" button and then click 'OK' and all the numbered .RAR files will 'uncompress' to your selected folder.